Posted By:LovelyLocks | At:1:20 PM Be the first to comment! His personal life has played out in the media for the past year and culminated with his wife, Vanessa, filing for divorce this week. 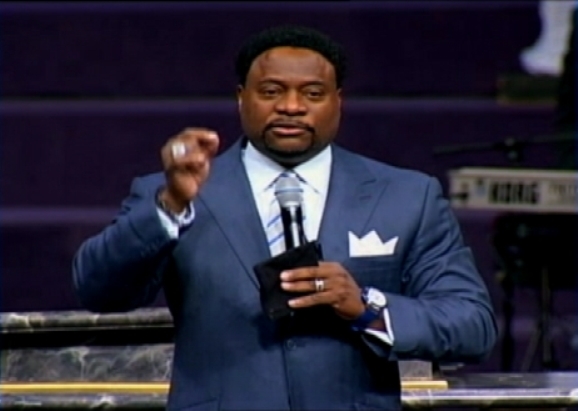 This morning, Bishop Eddie Long, addressed his extremely loyal congregation and stated that he "needed to take time off from the pulpit to work on his family." Long further stated that he loved his wife Vanessa and she loved him. He expressed the utmost confidence that they would indeed "work it out". 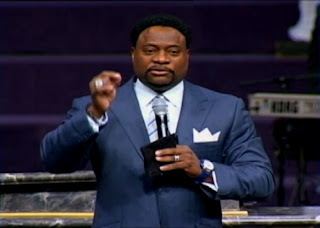 LITHONIA, Ga. (AP) - Megachurch leader Bishop Eddie Long has announced he's taking time off to focus on his family after his wife filed for divorce. Long's spokesman, Art Franklin, said that the New Birth Missionary Baptist Church leader told his congregation Sunday that he will continue to serve as senior pastor at the church in Lithonia, an Atlanta suburb. But Long said he needs a sabbatical. Long's wife, Vanessa Long, filed a petition for divorce Thursday in DeKalb County Superior Court to end her 21-year marriage to the embattled minister. The split comes more than a year after allegations that Eddie Long used his lavish lifestyle and position of spiritual authority to lure four young men into sexual relationships. Eddie Long settled the cases but has never admitted to any wrongdoing. The New Birth Missionary Baptist Church congregation, who stood by Long through allegations that he coerced at least four young men into sexual relationships and claims by former members that he induced them to participate in an investment scheme that robbed them of their life savings, say they still support and love their pastor. They are praying for his speedy return to the pulpit.